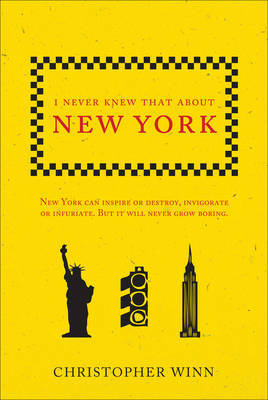 In "I Never Knew That About New York", Christopher Winn digs beneath the gleaming towers and mean streets of New York and discovers its secrets and its hidden treasures. You can learn about the extraordinary people who built New York into one of the world's great cities in just 400 years. New York is one of the most photographed and talked about cities in the world but Winn unearths much that is unexpected and unremembered in this fast moving, ever changing metropolis where history is made on a daily basis!